The Germinatrix » Blog Archive » Hang Me! 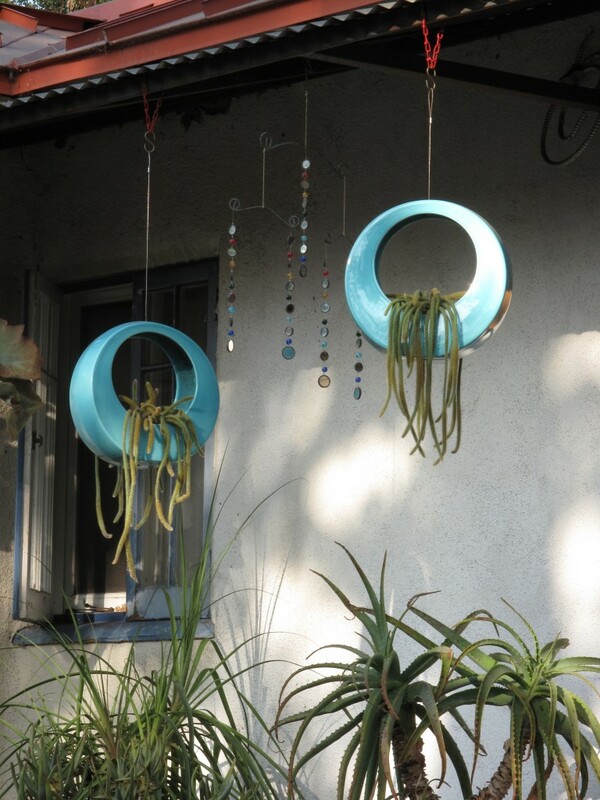 I love love love my hanging ceramic circle planters from POTTED! I’ve been feeling the intense desire to do a hanging garden these days – and this is my tiny beginning. Notice the “light chimes” (also from POTTED) that dangle like earrings near the pots. These are my FAVORITE things – they activate the light in a twilight garden. As the sun is setting, the mirrors glint and glimmer and throw little circles of light against the walls, the patios, the chairs, your guests – and turn an ordinary evening into a magical event. And when the sun sets, the little Tinkerbell lights leave as quickly as they came. I will DEFINITELY incorporate light chimes into my fantasy hanging garden! 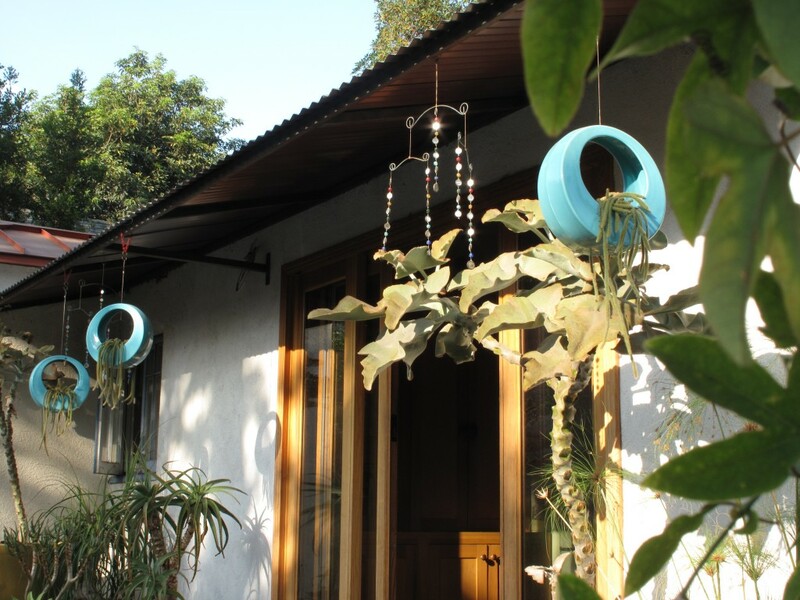 see the little lightchimes in between the super cool hanging containers? 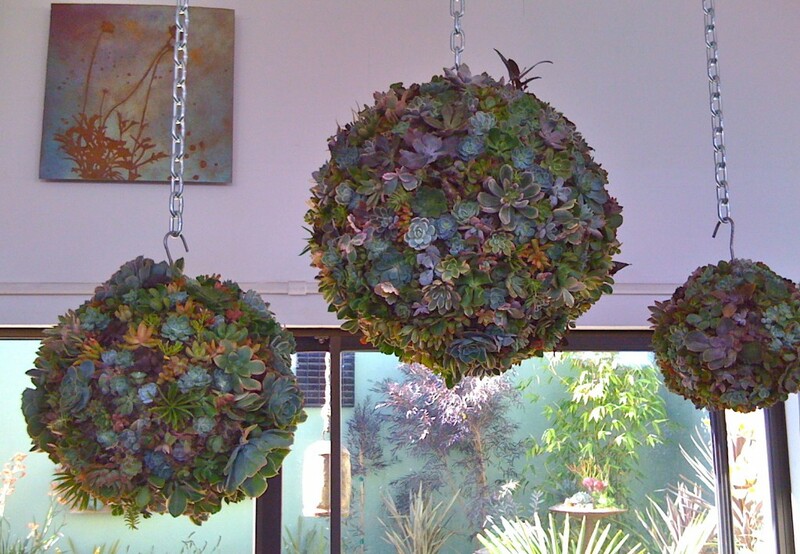 who can resist these orbs of succulent delight? There are SO many other things to add to the Hanging Garden! Staghorn Ferns, Tillandsias, Spanish Moss (I’m going to try with the moss even though it is pretty near impossible to keep this stuff going in a dry garden – I am nothing if not a risk taker!) This is JUST the beginning! Thank you POTTED, for having exactly what I need to get me started, and the inspiration to keep me going!!! *And just for the record, I purchased everything because I support my friends who have small businesses! This ain’t no punk operation I’m running here!!! Wow, the hanging spheres are amazing! Do you have any plant suggestions for growing these in Phoenix? Hey there Germi! Love LOVE LOVE those planters from Potted. I’ve been dreaming of them since I first saw them months ago. Love how you planted yours up. Wow! Great decorating idea with those hanging pots. Love those succulents ball, they’re look unique and cute. Appreciate and fantastic and I do like hanging style and I do like blog to share new adventure and new ideas,Thanks. If I lived just 10 miles closer I’d be in this store every weekend. Love their emphasis on Calif pottery. LOREE!!! I love these SOOOO much and I want more! Wait til you see the other hanging elements I’m planning!!! Why thank you, Starting! I am glad you like these – it is just going to get better! I also like hanging style Chicago Fitness – I think you might be spam but just in case you aren’t, here’s a nice response to your vague comment. Oh, this place is a WONDER – I have to make sure I have plenty of money every time I go! very cool! don’t get bit from the cactus thought! I love those circle planters. They look great on your patio. Fabulous looking K. beharensis, too. Mine always loses too many leaves to look impressive. That mobile is really nice!